The French Revolution is the theme of this year’s annual exhibition of works by our Costume Design students. 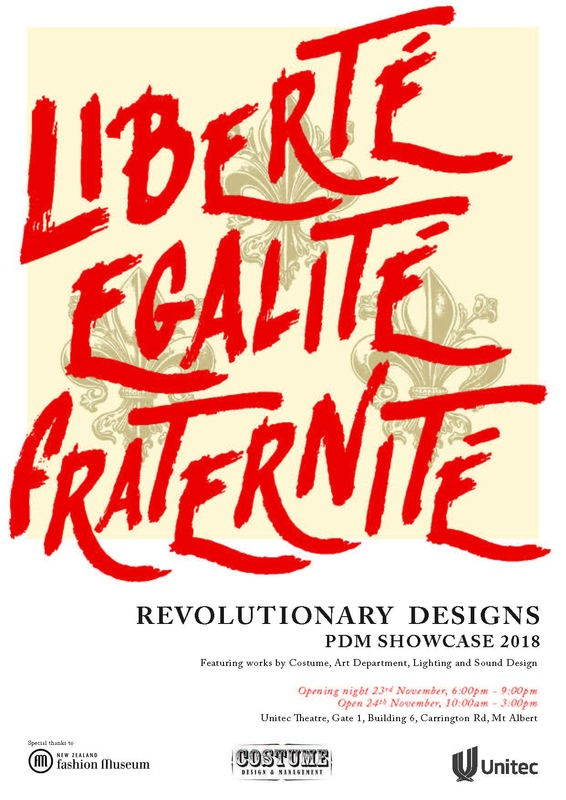 The two-day exhibition, which starts today (Friday, 23 November from 6-9pm), features French Revolution-themed student designs from costume design, art, lighting and sound. Unitec’s Theatre has been transformed into a scene reminiscent of Les Misérables, complete with a bastille, guillotine and brothel. Costume Design students have worked on the designs for their characters throughout the year as part of the personal project component of their three-year Degree course. The event is supported by industry, including Doris de Pont, fashion designer and director of the New Zealand Fashion Museum. Third year students Amy Tunnicliffe and Aimee Palmer drew inspiration for their designs from the Merveilleuses, who, along with their male counterparts, the Incroyables, were members of a fashionable aristocratic subculture in Paris during the French Directory of 1795-1799. The Merveilleuses scandalised Paris with dresses and tunics modeled after the ancient Greeks and Romans, made of sheer fabrics. Photo 3: Amy Tunnicliffe (green dress): Amy’s design features an emerald green sheer silk organza dress featuring detailed embroidery as part of the corset. She designed the shoes in collaboration with renowned shoemaker Louise Clifton, drawing inspiration from the painting ‘The Death of Marat’ by Jacques-Louis David. The bright red soles represent the blood that flowed during the Revolution. Amy has always spent her life creating and communicating with her hands. She studied for a time at Elam School of Fine Arts before joining Unitec to study Costume Design & Management. Amy has a role in the film industry, under the tutelage of acclaimed costume designer Jane Holland.